As a food blogger, I keep one finger pressed to the pulse. What's new, what's in, what's hot, what's not? These are absorbing questions. For example, coloured pants -- in. Such observations require careful attention, not to mention foresight. You will note as you observe the Reems Eats blog that Haley and I are attune to these nuances. We maintain a cutting edge profile. For example, we considered embedding video, only to realize that was on the cusp of old, so we didn't. We thought about Twitter but then realized the conceptualization of Twitter was really a lot hipper than Twitter itself in its digital form, so we left it at that. Online is still in, so we've stayed onboard. We also figured we'd keep the blog format for now but we have noticed that older, back-to-the-orgin type trends are making a comeback, such as canning or growing potatoes or using a typewrite; so heck we might just jump that trend and swap the blog for a log and do the whole thing in calligraphy. We're not sure. We're just going to see where the whole thing goes. But the hunter was never one to be outdone by the gatherer. Note who's name comes first (gather always follows hunter). Hunter has also returned to a place of prominence. Think bow and arrows. Think Hunger Games. Or tall green boots sold with accessorized socks. Friends tell me they'd like to hunt—fell a deer or two and stock their freezers. These are urban people, shades away from hipster. Maybe the hipsters aren't too far off. They're already in camo—dark muted tones. They blend into buildings or slouch against the rain-gray West-Coast sky. They tread with the practiced obscurity of the hunter. Even he-who-shall-not-be-named-on-the-blog (my hubbie) is doing it. Bow, check. Arrows, check. Deer, check. He's kicking off slippers, dashing out the door, sprinting across the property in hot pursuit. Fear not, his arrows are capped. In fact, I'm considering joining him and he's encouraging this line of thinking. He said I'd be useful in flushing out the prey. I imagine I could go springer spaniel style and dash into the under brush, yapping at deer hooves to angle the herd into the clearing. It's likely a good workout. If you've followed Reems Eats for any length of time, you've concluded that I'm always up for a good workout. Anyways, I think hunting could be a perfect opportunity. Although trapping—also a form of hunting—appears less cardiovascular. Perhaps if the trapline stretched over a number of miles I might receive something of a physical benefit. But perhaps I'll leave that for people in the Ozarks or those with snow and dogsleds. I read a pretty excellent Janet Oke novel in which the main character runs the trapline. She also always wears a braid in her hair. This is before she meets HIM and lets that braid loose and gives up the trapeline for more womanly pursuits. If you've read this novel and can recall the title, feel free to comment as I'd love to get my hands on it again. On a what's-hot-what's-not note, Haley tells me that braids are in. She says a good place to stay abreast of hairstyles is Pintrest. In the meantime, I've been gathering. To be honest, I prefer the status of the hunter position, as well as the thrill of the chase and the triumph of the kill but more and more in life I have come to realize that we don't choose our callings as much as we are chosen by them. It has fallen to me to gather. I gather for a few reasons. One is that once I've arrived home, I don't like to leave. This often puts me in the unfortunate position of having to scrape a meal from what's left in the fridge and the pantry. Also, I've recently learned I'm an under-buyer (read the Happiness Project to find out where you lie in the under-buyer over-buyer spectrum). As an under-buyer, I refuse to stock up. I refuse to buy all the essentials. I make do. I scrape, I salvage, I improvise. Which is exactly what I was preparing to do the other day when my eyes chanced across Julia Child's quiche formula in Food and Wine (thanks again, Haley, for the birthday subscription). Julia's great for supplying the bones of a recipe. She instructs you as to the technique and the essentials and allows you to fill in the gaps. I followed Julia to a bacon quiche. You might choose squash. Or better yet, bacon squash. Whatever. See what's in the fridge. Or if you have a herb pot, poke in there. This quiche is part of the weeknight dinner series. Haley and I are sharing stuff we make in the week that's easy and tasty and fun. 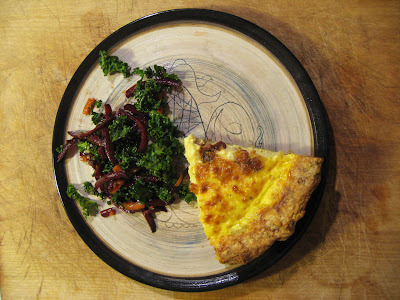 The quiche is easy if you keep pie dough in the freezer. You can make your own pastry or buy it from the grocery store. Either will be delicious. I always forget how good quiche is and whenever I've made it I think I should do it more often. It also makes for excellent lunch leftovers. Roll out a 1 layer pie dough. Once you've settled it into a pie pan, cover it with a piece of buttered foil or a piece of parchment paper. Fill the pie with dried beans. Yes, beans. You're not going to eat them; they are simply to weigh down the pastry and make sure it doesn't puff up with baking. Bake at 450 for ten minutes. Remove the foil and the weights and bake for another 7 to 8 minutes until it is very lightly browned. Crack 3 large eggs into a large glass measuring cup. Add enough milk to reach the 1 and ½ cup mark. Add some salt and pepper and whisk. Place half a cup cheese and your filling (in my case two strips fried and then chopped bacon. Chard is also nice or squash. Whatever you chose be sure to cook it first) in the bottom of the cooked pie pastry. Pour the custard in. The custard should reach ¼ inch below the top of the pie shell. If it doesn't crack another egg into the measuring cup and add enough milk as to equal ½ a cup. Beat that together and add it to the quiche. 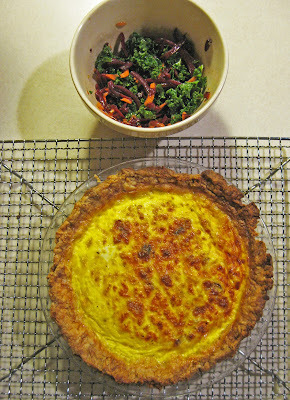 Top with quiche with a little more cheese if you'd like (I don't usually but I'm trying to make your quiche extra good). 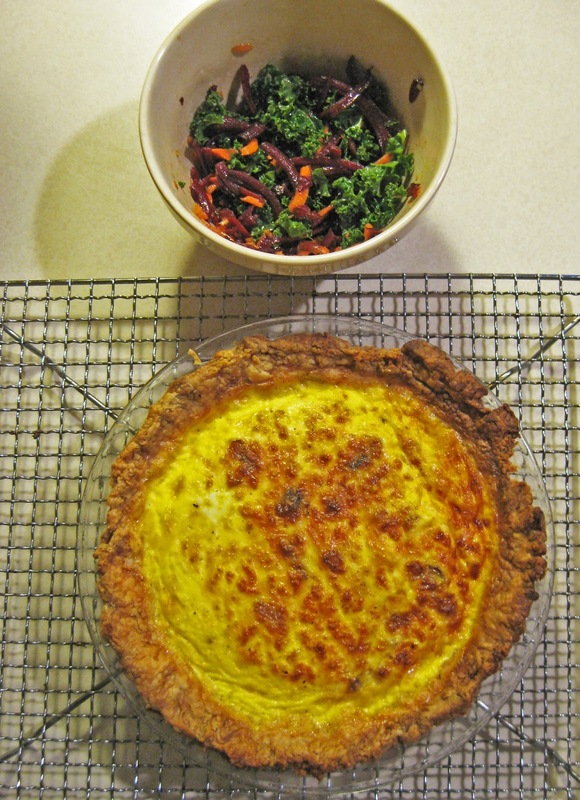 Bake the quiche at 375 for about 30 minutes or until set and browned. We're still learning about deer, it seems. Upon moving to the cabin (yes, in the woods) last July, one primary impression of deer formed in the minds of my dearest husband and I. Deer are cute. Trite, but fundamentally true. Deer wandered through our property in a small herd, two big (parents) and three little (offspring). As we began our new life in the country it seemed fitting that we should spy in on the goings-ons of this deer family. The image was so simple, beautiful, and natural -- all characteristics we'd anticipated of our new home. When Caleb or I, or I or Caleb, would spot a hooved and antlered soul wandering out from the woods, the alarm: "Deer!" would be sounded and we'd rush out to the deck for a closer glimpse. While our working definition of deer was taking shape, another classification was hinted at; warnings were given. My Aunt was the first. "They're dangerous," she told us. We laughed. "It's true," my brother echoed, later. He cited a story of a man attacked by a rampaging buck. Weeks went by before Caleb was confronted by the stag (okay, some sort of male deer). It hobbled out from the bush, weaving like a drunk-test failure. One antler torn and bleeding, the buck stopped short to lock eyes with Caleb before it pawing the earth and beginning its charge. Fortunately, the railing of our deck provided protection and afforded Caleb enough time to duck in through the front door. Safely inside, he peered past the curtain to watch the buck stagger back into the bush. The possibility of violence had reared it's deerish head. I remained unconvinced until one dark morning in November, from the seat of my bike I watched two bucks crash horns across Lochside Drive (picture that terrible scene in Bambi). A shadow was cast. Deer...who were they? As the year wore on our misgivings faded with our remembrances of long summer days and minted mohitos. Deer joined the backdrop of our lives. They grazed through our field and out again. No longer exclaimed upon, and no longer watched for evidence of Hyde-like behaviour, the deer had simply been forgotten. We turned our efforts to improving the house -- a new shower was installed -- and playing with the yard. With the master's path nearly completing it's route about the house, we turned our eyes to a garden. It took a number of days before an area was cleared and the grass broken to soil. We were nearly ready to begin. We had the seeds. I'd bought garden gloves. We'd enlisted help. It was time to fence. Here is were I pause to reflect upon what we knew of deer: deceptively cute, potentially dangerous. Deception, potential: these words remain central to my now expanded understanding of deer. These are the traits we failed to account for when we cut the beams for our fence and dug them into the earth. While the beams was a good start (the logs were solid and well supported and stood about ten feet tall), we went wrong with the string. At the time, it seemed best to avoid buying costly fencing equipment such as chicken wire or bamboo or any type of filler, really. Instead, we elected to run crisscrossing lines of coloured thread between the posts. Our garden now looked like it belonged in a compounded from a dystopian society. Uncertain about the strength of the string, we added intersecting branches to the fence. The holes were small and impenetrable, we thought. Happy with our work we planted and watered and waited. It wasn't long before the kale and lettuce pushed through the grown. The wheat (a madcap expriment) was doing particularly well. We waited and waited, but the greens didn't seem to be getting much bigger. Examining the soil in the kale box one afternoon, Caleb refelcted that it almost seemed as if something had gotten in for a nibble. A rabbit we thought, or a cat. Did cat's like kale? Deep into a Sunday afternoon, lazy from a nap, Caleb steps out onto the deck. There is a moment of calm before he looks to the garden. In that glance he takes in the absurd lines of colour, the mangle of sticks, and a brown body curled in the lettuce box, finishing its own afternoon nap. With a leap Caleb is on the gravel, running, shouting, ready to strangle the deer with his bare hands. But he's no match. No match for the deception of stillness, in a flash the deer is moving, or the potential for maneuvers, the deep steps through a small space between one pink and one yellow string in a hoof beat. With the flag of his tail flying, the deer vanishes into the thickness of the forest. Since, we've added a layer of chicken wire to our dystopian fence and when the deer come visiting, it isn't 'deer, comes see,' that we shout. 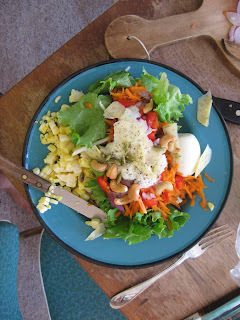 I bought the lettuce for this salad at Michell's farm. Cut up some bread into pieces, toss it in a bowl with olive oil, salt, pepper, and chopped herbs. Spread it on a baking sheet and bake for about 15 minutes at 300, or until the bread is cruchy. Put all the ingredients except the olive oil in a food processor and process unitl smooth. With the blender running, slowly add the olive oil. It should emulsify as you pour. Choose your favorite lettuce, tare it into bite sized pieces, toss with dressing and garnish with croutons and more grated cheese. Yum. Oh Monday, how I wish we could just get along. You don't make it easy to bounce out of bed and wrestle clothes onto two little monkeys. You don't make going to work very fun when I haven't had a chance to read the paper, or even make a cup of coffee. Oh Monday, the best thing we have going for us is our shared love of chocolate, and crawling into bed at 8pm with a book and a big pile of pillows. I guess we're meeting half way. One thing that makes Mondays a little friendlier is a lovely salad waiting for your lunch. A salad that was lovingly prepared on the weekend and will allow you an extra piece of leftover chocolate cake for dessert. This salad is great because it lasts in your fridge for a few days and tastes delicious and virtuous every time. This could be made using quinoa, or any other type of grain in place of the barley. 2) Chop veggie add-ins of your choice: For this particular salad I used red pepper, green onion, and olives. Tomatoes, avocado, or cucumber are options, but should be added just before eating, not if you plan to save this salad for a few days like I do. 3) Other add ins: I add chick peas and crumbled feta cheese or chevre. Fresh herbs such as basil and cilantro are also nice additions, but I admit I usually just have them on hand in the summer. 4) Toss the barley and additions with your vinaigrette. Vinaigrette: I combine 4 T olive oil (or canola) with 4 T wine vinegar and 1 tsp dijon mustard. Then add salt and pepper to taste. You may need more or less vinaigrette depending on your veggie quantities. Receiving a complementary facial at the noodle bar due to massive amounts of steam generated by boiling pots of noodles, pork, and broth. Never let Haley out of your sight or she might shame the entire ReemsEats corporation by lining her baking sheet with nearly ten pieces of parchment paper. Using a kitchen scale is more accurate and faster than volume measurement. Add baking powder to sweet yeasted dough for a shorter dough. Take the time to go to Vancouver to hangout with Haley. The rewards are infinite. Now, I know I was to post a Stollen recipe as a companion to this post BUT I have a better idea. Remember, on the way to the ferry, when we stopped on Granville, slipped into Williams and Sonoma and sampled apple cider and that amazing butternut squash soup? I made the soup. The recipe is online and you don't need to buy W.and S.'s bottled pureed squash, at the exorbitant price of thirty dollars a pop. Here is the recipe (the link is not showing up--but click on 'recipe'). It is hands down the best B.S. soup I have made. Be sure to use stock, not water. I have been a negligent sister of late, which is why I’m giving you a particularly juicy post. Don’t expect a lot of words, here. It’s 8:11 on my kitchen clock. It’s been some time since we’ve lived together but you might remember that I’m not exactly a barrel of sunshine in the wee hours. And when one starts one’s work day at 10:00 at the earliest, that makes 8:00 the equivalent of 6:00. So instead of feeling guilty for sitting here in a tattered green robe with no inclination of brushing my hair for at least another hour, I’m pleased by ---kettle boiling---my early rise and this industrious start to the day. Oh, and there’s Caleb, doing a monkey dance in purple underwear. This is my world. Time for an Americano or two and a piece of toast. This is my country whole wheat sourdough bread. It’s nearly 100% whole wheat, save for the starter which is made from all purpose flour. It’s really good. The crust is crusty! The texture is open--it’s a very rustic bread with not much of a sour flavour to it; the starter is fairly mild and overrun by the flavour of whole wheat. 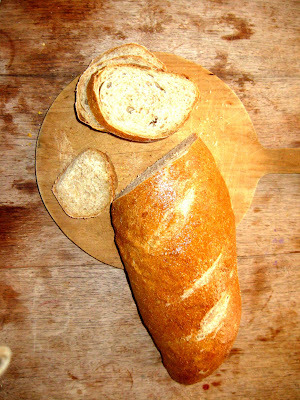 You can use the starter to make other types of sourdough bread. You need to take a week in advance to make the starter, which you can then keep indefinitely in your Frigidaire. You also need to be flexible and ready to pay attention to your intuition. Mix, then let stand at room temp until tripled in volume, 8 to 24 hrs. Refrigerate for three days. Cover and refrigerate for three more days. It’s ready to use. Every time you use it, you must feed it. To feed the starter, divide it in half. Half you will use for your recipe, and the other half you will feed and return to the fridge. After dividing add 1 cup flour and ½ cup water and return the starter to the fridge. Combine these ingredients. Let the preferment sit at room temperature from 8 to 12 hours. It should be bubbly and have risen noticeably. Mix using a wooden spoon. Then use your hands to lift and fold the dough over on itself. This is to ensure that all the ingredients get incorporated throughout the dough. The dough will be quite wet and sticky. It will get all over your hands. If you want to minimize the dough to hand stick, wet your hands before touching the dough. First Rise: Cover the bowl and let the dough rise for 8 to 10 hours. The dough will have risen but it doesn’t need to have doubled. Flour your counter top then use a spatula to scrape the dough onto your counter. Use a knife to cut it in two. Flour your hands and shape each dough hunk into a boule (fancy word for ball). Flour two cotton tea towels and set each in a colander or bowl. This is where you will place your dough to rise. The bowl/colander will give the dough shape as it rises. Second Rise: Let the boules rise for 2 to 2.5 hours. They will have risen noticeably and look sort of puffy. They will not necessarily double. Baking: Half an hour before you plan to bake the dough (ie, when the dough has half an hour left of rising time), place two round casserole dishes or over-safe pots into your oven and preheat the oven to 450 degrees. If you don’t have round pots you can use square but round are much preferred. After 20 minutes to half an hour of preheating time. Put on your oven mitts and remove the pots from the oven. 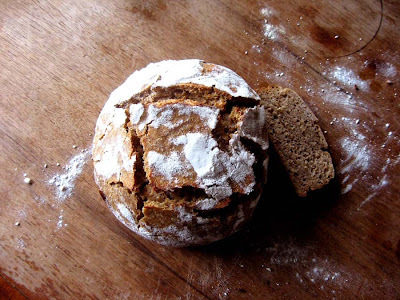 Gently put your hands under one boule and tip it into a pot. Put the lid on top and place it gently in the oven. It will deflate a bit. Don’t bang the pot into the oven as you don’t want to add to the deflation. Repeat with the second boule. Bake the boules with the lids on the pots for 30 minutes. After 30 minutes remove the lids and bake for another 10 to 15 minutes. Let the bread cool completely before cutting in to it. Classic on your last post, slipping in a picture of Coby beside the salad. Mutually related? Uncertain. Did she partake of the salad? Doubtful. Make the salad? Improbable. But she's dang cute. 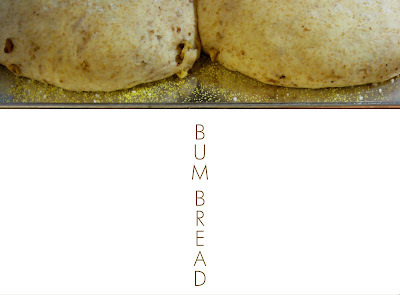 This is a new bread recipe I wanted to share with you. Have you been baking bread? I'm quite excited about baking more bread in two weeks when I'm finished my job. I have all kinds of ideas floating around in my brain for different combination of ingredients. I want to make a yeast-risen banana bread, with coconut milk. Stay posted. Anyways, this is a buckwheat recipe I dreamed up. Don't try to up the amount of buckwheat (I well know your habit of jimmying with a recipe). The ratio is just right. Particularly as buckwheat is without gluten and actually inhibits your dough from rising. 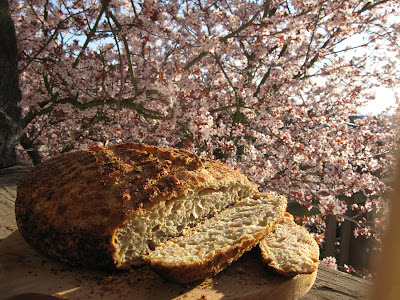 In this bread, it dominates the flavour, while the bread remains light. Anyhooo, please try it! Add remaining flour 1/2 a cup at a time, beating smooth after each addition. Knead 5-8 minutes. Dough will be tacky. Add flour by the tablespoon if necessary. First Rise: 1 and a half to 2 hours (until doubled). Shape into two rounds (I used clay bakeware but next best is rounds on a cookie sheet). Place on a greased cookie sheet and let rise, covered, for 1 hour (or until doubled). As youknow, I've been into bread lately. Something about the change in season has me baking bread and simmering soup. Perhaps it's the plethora of squash and apples, both inspiring fruit and veg. The new chill in the air has cooled down the apartment considerably. In August, and for most of September, it was sheer torture to have the oven on for any length of time. With the extra heat put out by the oven, the temperature felt well over thirty degrees. We could pretty much strip to nothing and fire up the hot yoga. Hmmm. 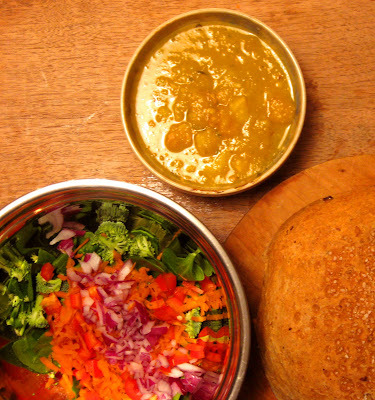 Hot bread, hot yoga. Possible enterprise? We could call it smokin' buns. Anyways, I've been messing around with sour dough and doughs with higher moisture content to get nice big holes in my bread. I recently picked up a book at Russels, that great used book-store, called "No Need to Knead." 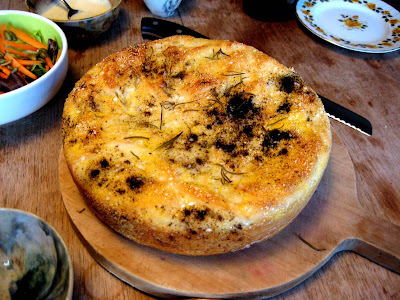 There's a recipe for focaccia that you should try. Only you must swear not to reveal how absurdly easy this bread is to make. It is perfect for serving with pasta, or bringing to a dinner party just to show off. Measure water into bowl then add yeast. Stir until dissolved. (I used instant yeast. I mixed it with the 2 cups flour and salt, then added the yeast. Remember, if you use instant yeast, your water needs to be hotter, about 110). Stir in 2 cups flour and mix until smooth. Add the rest of the flour and mix until the dough pulls away from the sides of the bowl and forms a loose, messy ball. The dough will be wet and sticky. That's okay. Cover the bowl and let the dough rise in a warm place until doubled. It should take 30 to 40 min. (Mine took over an hour). Shaping: Pour the dough onto a cookie sheet. Push and stretch it to fill the sheet. Or, do as I did and pour your dough into a skillet or two. I used a cast iron dutch oven. A corning ware would also work well. There is no need to shape the dough. Just let it lie as it falls into your chosen vessel. This is a very forgiving dough so don't be afraid to experiment a little. Sprinkle with olive oil and other toppings. Let the dough rise for another half hour. Bake the dough in a 400 degree oven for 30 to 40 minutes. The bread should sound hollow when tapped on the bottom. Let cool on a wire rack. I love a good chicken salad sandwich. This is the lunch that proceeds a roast chicken dinner.. or my 'quick stop and pick up a roast chicken from Safeway after work because making dinner would take way too much effort' dinner. I covet chicken leftovers simply for a glorious sandwich. I have to admit that this is a purely selfish indulgence, as I am married to (gasp) a man who doesn't eat chicken. I'm not going to provide a recipe, but more of a method. First strip your leftover roast chicken. You want all the viable chicken that you can get. If you are really trying to get the most out of your bird you can use the remaining carcass for chicken soup. Next chop or shred your chicken. Now for your saucy bit. This is a personal preference - do you like your egg salad wet or dry? I like to use equal parts mayo and yogurt. For seasoning I add to taste: salt, pepper, a bit of garlic powder, and a good pinch of curry powder. Finally, you need your add-ins. I insist on something from the onion family - green onion is what I usually have handy, although you could go with finely chopped red onion or shallots. I also like to add a handful of slivered almonds or chopped pecans, and for the really adventurous souls I love the addition of sliced grapes. Mix it all together, find a good bread, slice on some avacado (if you have it, it also stands on its own) and voila! I'm into bread. Nothing beats pulling a hot loaf from the oven with your own two mitted hands. I love the concept of creating something so tasty and nutritious (Atkins- bah) from the simplest of ingredients-- flour, yeast, salt, water and, sometimes, sugar. Bread encapsulates the miracle of baking. The raw ingredients in your mixing bowl are completely transformed by the process of mixing, kneading, rising and baking. Although for this particular recipe, there's no need to knead. This is the easiest bread you can possibly bake, and, at the same time, the most sophisticated. I found the recipe in Mark Bittman's How to Cook Everything. The ingredients are simple, the process is stupidly easy, and you wind up with a loaf of artisan bread. It's very exciting. No really, I was a little giddy when I cut my first piece. This loaf is for the beginning and experienced baker a like. Appropriately titled "No Work Bread," The dough does not require kneading. Instead, the yeast develops over a delayed fermentation period (18 hours). Baking the bread in a hot pot or corning wear creates a cracked artisan-style crust. The texture is open, with lots of those wonderful holes. The warm weather this week has me dreaming of spring.. and summer.. and local veggies..
olives -some may consider this optional but I don't. If you really hate olives could you please just pick them out for the sake of the rest of us? I'll leave the amount and the type to your discretion. Feta cheese - as much as you've got. Well, maybe a cup of crumbled cheese. See what that looks like and, with my blessing, add more if you feel thus led. That's it. stir it all together. And voila, you've got a great side-dish to your chicken souvlaki and enough left for lunch tomorrow. 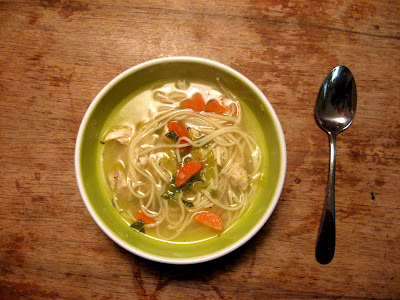 Chicken noodle soup can be quite good, especially when you make your own stock. Although this is not essential, it is satisfying. You can buy a decent stock and in a carton and use that. This saves time. And chicken noodle soup is made to be lazy, simply luxurious. Like a good chair. Or a hot bath. I made mine from Nigel Slater’s recipe, found in his “The Kitchen Diaries” cookbook in his January 19th entry. The book reads like a diary, a recipe for each day written nestled between practical advice and simple musings. He seems dreamy, this Nigel Slater. Apparently he’s a top British food writer, but I’ve only just discovered him. I might have a crush. My variation on Nigel’s (can I call him Nigel?) soup was delicious, simple yet made fresh by mint leaves and lemon juice. Hats off to you Nigel. Bring a pot of salted water to boil. Add the noodles and boil for a couple minutes until tender. Drain. Rinse them in cold water and leave them to soak in bowl of cold water. Put a shot of oil in the pot. Add the leek and carrot. Let tenderize for a few moments. Add salt. Add chicken broth. Bring to a boil. Turn the heat down to a simmer and add the chicken, the mint, the thyme, and the lemon juice. Simmer for 3 to 10 minutes, depending on your schedule. Make sure the carrots are tender. Add the noodles. Add salt and/or pepper if need be. Simmer for one minute. Serve in big bowls. Nigel seems to think it serves two. I’d say at least three but I think I added about 400 grams of chicken. The wood grain of my desk has gone incognito, obliterated by a bomb of binders, sticky notes, memos, and schedules. A hot dog day order form, a basketball team roster, an IEP, another IEP, a stack of photocopying, a giant pair of dice, a bell, a recipe for brownies – ah, there, the recipe for brownies, now I can pedal home. A pink sky, a dry road, and the whir of a freshly lubed chain follow me up Hillside Road. I wonder about dinner. Walnuts, I remember, and stop at Fairways. The store’s bulk section is ho hum. Lately I’ve shopped for nuts, grains, spices, and interesting flours at the health food store in Sidney. I found dried lavender and the surprisingly elusive whole-wheat pastry flour. My bag is heavy with the nuts and all the other bits and tins I suddenly remember upon entering a grocery store. I dismount at the top of the hill and watch birds fly from the crooked deck. I love our neighbourhood with its mismatched houses and quiet streets tucked between busy throughways, and, of course, the slightly dodgy Quadra Street Village, home to the excellent Caffe Fantastico and James’ Caribbean Café. I love that I’ve finished with children and chalk for the day. In my apartment, on a shelf, a mass of inflated dough waits for me to push it down, turn it onto a floured board, and knead walnuts into its sticky skin before patting it into two round loaves for the final rise. Kneading bread at six thirty a.m. before beginning a day teaching middle school may very well be a symptom of insanity. But there I am, hazy with flour and sleep, rising with the yeast (clever, huh?). I leave the dough to lift while I spend my day at school. Later, five o’clock p.m., I feed it walnuts and give it one last squeeze. The final rise finishes at six. Into the oven and at seven o’clock we have fresh bread. Life is good. This is Flo Bracker’s recipe. I haven’t changed it. Haven’t even tried cutting the fat. It’s just that perfect. Sprinkle the yeast and a pinch of sugar over the hot water in a large bowl. I test the water on my wrist, it should feel quite warm. Set aside for 15 min to proof. It should be a bit bubbly when done. Add the lukewarm water (it should feel a bit cooler than your wrist), sugar, oild, unbleached flour, and salt to the yeast mixture; mix until wall blended. Add the whole wheat flour. Do this bit by bit. You may need more or less. It depends on the dough and the day. Turn the dough onto a lightly floured board and knead until smooth and elastic, about fifteen minutes. My rule is you can never over-knead. Place the dough in an oiled bowl, turning it to grease the top. Cover and let rise in a warm place for 2 to 4 hours. On the aformentioned day, I left my dough to rise for over eight hours. I left it at a low room temperature, probably about 17 or 18 degrees celcius. Typically, for the regular rise, I put the dough in the over, after I've warmed it just a little. After the dough has doubled in bulk, punch down. Work briefly and gently with your hands to press out bubbles and deflate it. On that floured board, knead in the walnuts until evenly distributed. Grease a large baking sheet (I simply cover one with parchment paper) and sprinkle it with cormeal. Divide the dough in half and shape each half into a round loaf. Plach the loafs on the baking sheet. Sprinkle the tops with kosher salt and a little cornmeal. Cover and let rise in a warm place until doubled, about one hour. Preheat the oven to 350 and bake for 45 minutes. The loaves should be light brown and sound like a hollow tree when you knock their bottoms. Admittedly, over Christmas I eat treats, a lot of treats. At a certain point I become saturated, stuffed to the top with sugar, chocolate, butter, and other terribly wonderful substances. Dinner is a slapdash affair, left over dip, sliced deli meat, a hunk of stollen. I begin to mourn veggies, tofu, and fruit smoothies, for they have been squeezed out, replaced by the pre-Christmas pickings. Right now, a pile, no, a small mountain (think Finlayson, not Baker) of cookies rests on my counter, offerings for the weekend’s festivities. But I am not tempted. I, the ultimate sweet-tooth, ate a mere half of a cookie, and a good cookie at that, and my head spun. I’m finished on cookies, maybe forever, more likely until tomorrow. This year, thank goodness, I thought in advance. Anticipating the ambush of sweetness, I checked out my new favourite veggie cookbook from the library, Fresh at Home, which was written by the owner of Fresh restaurants in Toronto. Healthy rice bowls, salads, and smoothies populate this book. Thus I am armed and ready. During the holiday bonanza, I like to prepare lighter meals, fresh meals. For instance, yesterday’s dinner consisted of warm bread (prepared by yours truly), soup (oh, me again), and salad (naturally). Soup in the fridge is a must. Throw some in a pot on the stove and dinner is ready in a matter of minutes. And trust me, it should be filling enough after the Friday afternoon staff treat-fest in the break room, the box of gratitude chocolates left on the counter, and the mocha that accompanied your stampede through the mall before heading home. Typically, I look in the fridge before deciding what soup to make. Yesterday I looked on the fridge, at the pumpkin which has been loitering there for the past couple weeks. With a sweet potato on the counter, I was ready to liquefy. This soup is really quite nice, with a smooth, sweet flavour, compliments of the sweet potato and a little maple syrup. In addition, roasting the veggie before tossing them in the pot brings out their best. Roast on a large cookie sheet in a 350 oven for about 45 minutes, or until the veggies are tender and roasted. Be sure to mix the veggies a couple of times during the roasting to ensure that the cook evenly. If the soup seems thin, don’t worry it will thicken as it cooks. Bring the soup to a boil and reduce to a simmer. Chop the sausage and add it to the soup. Let the soup simmer for at least 5 minutes with the addition of the sausages. Adjust seasoning by adding more salt and pepper if needed. Also, add water if the soup has become too thick. You are ready to serve! Peter Piper Puts Peppers into Pesto..
Finn and I happened upon a beautiful vision of peppers today. Well, a beautiful stand with bags of peppers just waiting to be gobbled up. I got to work roasting the peppers and making a red pepper and spinach pesto, as well as a red pepper hummus. I've always loved roasted peppers but hate, HATE taking the peel off them. I have solved this problem -why bother? There is nothing wrong with a bit of skin. After you've taken the charred bits off you can just chuck the lot in the blender and be done with it. I sliced them in half, seeded, and rubbed, no 'massaged', a little oil onto the peppers. I placed them on an oiled cookie sheet and popped them under the broiler for about 5 minutes. Don't stray too far, when they start getting nice and blistery (charred little black spots) take them out and pop them into a bowl, cover with saran wrap and let cool. When cool you can skin them or, take a note from a lazy cook and if you are using them in a sauce or dip just chuck them into your blender or food processor. For my pesto I put 2 peppers (4 halves) into the blender. I added the "juice" from the pan, about 2 tablespoons olive oil, about a 1/4 c of pine nuts, 2 handfuls of spinach, garlic, salt, and pepper, a dash of balsamic vinegar, and a crumble of feta cheese. Add a little bit of water if necessary, until you get your desire consistency. I would definitely say that this was more of a Mediterranean pesto. It would have been prettier without the spinach but I need to resort to trickery to get sir Mikey to consume his veggies. Make hummus. Add roasted red peppers. Done. I have a mini-me. Seriously, Finn loves his food. This kid can put it back just like his mom. Fortunately for me, Finn is showing more of a Reems approach to food (MikeyC being the most "particular" eater ever. Not an exaggeration). Unfortunately for me, the little food-monster is a beggar, and so I need to cook when he is having his afternoon siesta. Lately these hours have become a full-blown cooking frenzy. Today I made two loaves of banana bread, a batch of corn chowder, and cheese scones. Now my new town, Chilliwack, is the land of corn. Cows and corn. There is a "corn drive-through" on every corner. There are entrepreneurial five-year olds sitting behind mounds of corn. To live here, you have to love your corn. We've eaten enough cobs for awhile and so I decided to try a chowder. Chop up some celery, garlic, and onion - red pepper would be great too. Saute this in a few tablespoons of butter over low heat. When nice and limp, and smelling oh, so lovely, stir in a few tablespoons of flour. Next, add a few cups of water. Then add a diced potato or two (I used left-over roasted potatoes chopped fine). Cook until potatoes are tender. Then add cooked corn-off-the-cob- as much as you have. Today I had two cobs. Season with salt, pepper, thyme, chili powder, or whatever else you want to jazz it up with. If you want you can put everything into the blender at this point, or you could leave it a bit chunky. I like the best of both worlds and use my hand blender for a rougher texture. Finally, add a few cups of milk, and heat through. Garnish with green onions. Voila. Lift up a ladle to Chilliwack. Recently, people have been telling me that they love September. I can see their point. The air is warm, the sun is shining, the apples are ripening, and the blackberries are falling off the bush into my pail. Also, the crowds of tourists and teenagers have nearly disappeared. For these reasons September makes me happy. But September is also a month of change, back to school, back to work—new jobs, new people, new responsibilities. Suddenly I have a tummy ache. I haven’t truly started September. My first day of work is Friday (tee hee) so Caleb and I have still been playing at summer. And when it’s hot, because it is, and I’m spending my days on my bike or at the beach, I don’t like to eat large hot meals. Last night, Caleb and I whipped up what we’ve taken to calling the Quick and Dirty Salad, a mound of fresh rice and veggies topped with cheese and protein. The recipe is very simple and, naturally, very flexible depending on what you’ve got in the crisper but I provide the recipe as a guide, a starting point, and a source of ideas. Also, I wanted to post this stunning photo. Usually, I have most of the ingredients that require cooking left over from a previous meal. For example, I wouldn’t make rice specifically for the salad as it needs time to cool. Instead, make a little extra for your stir fry and save it in the fridge for your salad. Assemble the above ingredients on two plates or pasta dishes. I suggest putting the cheese and seeds on top. This recipe comes courtesy of Joan Reems (my mother). I believe it’s the best one she’s ever given me. I always have a batch in the fridge as it’s so simple to prepare and so much healthier than commercial dressings. Oh, and it tastes good. Combine, adding more water depending on desired consistency. Due to poor blogging habits Reems Eats is in serious jeopardy. I' m therefore feeling a lot of pressure to publish a recipe that is going to propel us back into the blogosphere. I'm going to stay tried, tested and true. Here is my standard "company," or potluck, salad. It has a loose formula thus ensuring that no two salads are ever the same. Avacado. I know, a veggie. However, my love of the avacado demands it gets its own category. You can skip the avacado, but why would you want to? Cheese -I usually go with crumbled feta or chevre. You could mix it up a little and maybe try some cubed havarti or wouldn't some smoked gouda be fab? Some fruityness. Depending on what the season is. In strawberry season there really is no other option. In the winter I often just chuck in a handful of dried cranberries. Mango slices or halved grapes also work well. Nuts. Toasted and slivered almonds, pecans, or walnuts are all good. If you have the time and really want to go to the next level - Heat up a small pan with a touch of butter. Add a few handfuls of the aforementioned nuts. Now add about a teaspoon of sugar, some salt, some pepper, a dash of cumin, a dash of chili powder, a dash of cinnamon, a dash of garlic... you get the idea. Toast until all nice and crusty with deliciousness. These nuts are awesome and can be a stand alone snack as well. Dressing. In a pinch I use some sort of bottled vinaigrette - Kraft's light sundried tomato or light poppyseed are my go-to's. If you have even thirty extra seconds - Combine a few glugs of balsamic vinegar with one glug of olive oil. Add maybe half a teaspoon of sugar, a smidge of garlic, salt & pepper, and any herbs you have around. mmmmmm! There it is. The salad formula. The spinach salad pictured isn't doing this formula justice. Happy lettuce! Wonton Soup and Other Delights..
Aaah, Spring.... Aaah, Calgary. Spring has not yet sprung in snowy Alberta. This calls for soup, and lots of it. Yesterday being Tuesday, and our pool day, I decided to go with chicken wonton soup. I made the wontons and chopped the veggies in the morning and all I had to do apres-swim was put the broth on to simmer and combine everything in the pot. I love wonton soup and discovered how easy it is to make in Feb. when I got it into my head that we needed to make wontons to celebrate Chinese New Year. This time, in an effort to increase the health benefits of the meal, I opted for ground chicken instead of the traditional ground pork. Wonton wrappers tend to be in the grocery store next to the tofu- usually near the produce aisle. They are inexpensive and last for a long time in your fridge. I have tried putting the leftover wrappers in the freezer but will get back to you on how that works out. 1) Make wonton filling - You don't need tons of meat, as each wonton only has a heaping teaspon of filling. For three people I used about a pound of ground chicken; however, I only used about half of the filling and froze the rest for future use. Take the ground chicken and add whatever seasonings you want. I added aprox. 2 tablespoons of soy sauce, pepper, ground ginger, garlic, and the whites of the green onion chopped very fine. You could experiment with the seasonings. 2) Make the wontons - Take a wrapper and put a heaping teaspoon of filling in the centre. Next moisten the area around the edges of the wrapper and fold the wrapper on the diagonal. You can then bring the two bottom corners together with a dab of water, or you can just bunch all the loose ends together and dab with water. You can't go wrong as long as the filling is locked in. Cover and save until you need these. For three people I counted on Monica and I having about 6 wontons each and Mike at least 9- I made around 23 or so. 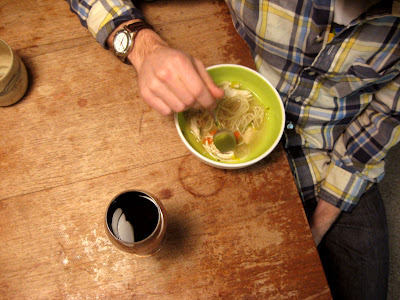 4) Get broth going - I would avoid powdered chicken broth for this soup. Go with the stuff in the carton or better yet make your own (I have only done this one time and it was a lengthy process). I heated until boiling: one carton of low sodium chicken stock and a few cups of water. I added a bit of soy sauce, freshly ground pepper, grated fresh ginger, and garlic. Oh, and a dash of sesame oil. I love sesame oil. 5)When broth is boiling add veggies and wontons. Let simmer for at least 5 minutes - the recipes say 5 minutes but due to my raw meat paranoia I let it go for 10. I also like to add some cubed tofu to the broth. When Mike is away I go really crazy and add some prawns as well. Also.. I just wanted to show off the rockin' meal that Mike made on Mon- snapper and sesame seed-coated asparagus. Mikey C takes a creative approach to cooking and will not divulge his secrets recipes, but isn't it pretty?